A blanket ladder created with Krylon® satin and metallic finishes is the perfect way to make sure you stay warm when the weather is cold! In a well-ventilated area, cover a flat surface with a drop cloth or tarp to protect from overspray. Read the safety and application instructions prior to spray painting. Spray paint the nuts and bolts with Krylon® ColorMaster Paint + Primer in Gold Metallic. To achieve the pictured look, spray 2 coats on each. Spray paint the reclaimed wood boards with Krylon® ColorMaster Paint + Primer in Satin Italian Olive. For a rustic look with the natural wood showing through the paint as pictured, spray 1 coat. Allow the painted pieces to dry fully. Saw one of the 8 foot boards into five 30 inch pieces to create the rungs. Cut a foot off the ends of the other two 8 foot boards. Evenly space the rungs on the newly created 7 foot boards. When the rungs are in place, use your screw driver with a spade to drill through the rung and ladder. Add bolts to keep the two pieces together. Reattached the foot long wood pieces to the 7 foot vertical boards with hinges so that the top part of the ladder lays flat against the wall. 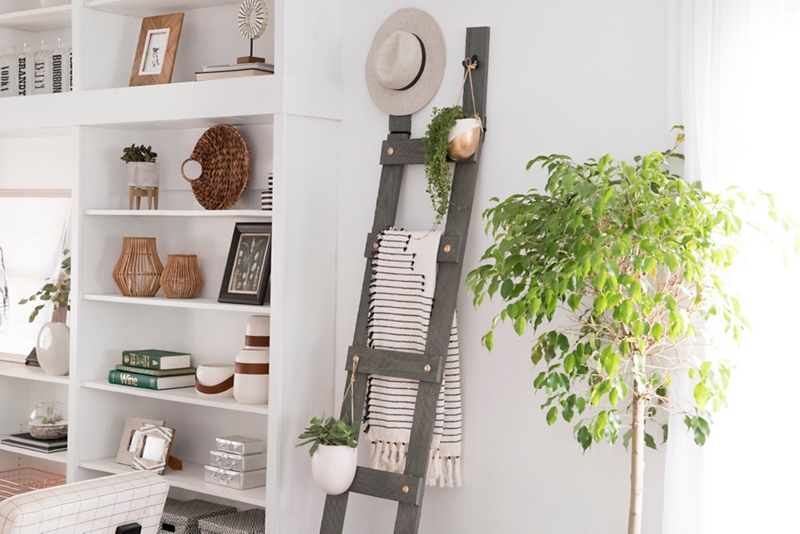 Screw in hooks to hang plants and stabilize the ladder.